AUDIOLABek Italiako Besenellon ospatuko den SIMPOSIO INTERNAZIONALE SUL PAESAGGIO SONORO ekitaldian parte hartuko du. Topaketa honek aurten Soinu paisaiak eta soinuzko identitateak izango ditu hizpide, hortarako nazioarteko adituak bilduz. Horien artean AUDIOLABen ordezkaritza betez Maiatzaren 23an Xabier Erkiziak “Lerro artean soinu paisaiak bilatzen” izeneko hitzaldia eskainiko du. Stefano Zorzanello (I) – Identity and sound identity, which relations within the landscape? Lorena Rocca (I) – Differential spaciality and sound identities compared: Ongoing processess. 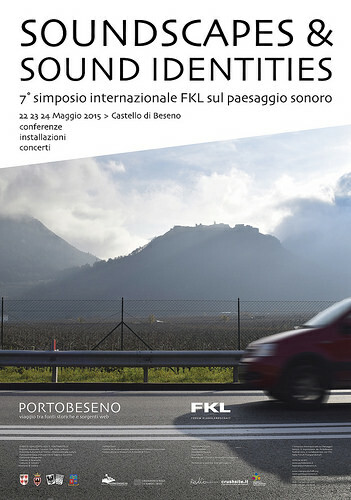 Massimo S. Russo (I) – Sounds and silence in form of identity? Jean Marie Rapin (F) – Can acoustic science contribue to the quality of the sound environment? Peter Plos, Paule Perrier, Luiza Schulz (A) – L.A.B. Dio Anemogiannis (GR) – Soundscaping Ouseburn Lives: An interdisciplinary study about the appropriation of sounds as intangible cultural heritage and their use in the heritage interpretation practice. Francesco Fusaro (I) – A Room Of One’s Own? – Soundscape of Taranto on Sunset.